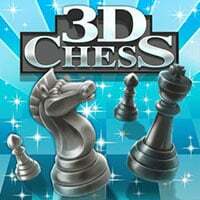 Train your logic and strategic skills with one of of the most popular board games worldwide and play a cool 3D Game version of chess! Challenge a friend on the same device or play against the computer. You can select one of 7 difficulties which matches your abilities best. So can you improve your skills and become a true Grand master? This game is one of the board puzzle games on Round Games. Enjoy and have fun in playing this 3D Chess Game. You may also enjoy playing Real Freekick 3D Game and Nova Xonix 3D Game. We picked up these games for you from our 3D Games.